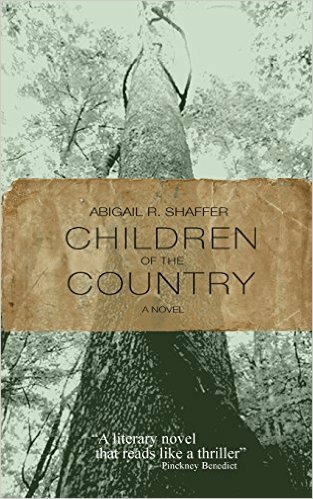 Abigail R. Shaffer’s debut novel Children of the Country is a stark depiction of the modern American South. Set in the Ozark Mountains of northern Arkansas, the novel tells the story of a small community embedded in beautiful country. Once an untamed and mystical place, it is now the sight of poverty and crime. These children of the country, adults and minors alike, struggle to survive in their changing region, carrying the burdens of their past along with them. With plainspoken, relentless prose, Shaffer weaves a nuanced and piercing tale in the unmistakable cadence of the region. Think William Faulkner with a grittiness reminiscent of Larry Brown. Front porch rockers, dirt roads, and pick-up trucks abound, but this is no Dixieland show. The Whistle Stop Cafe has been razed. The Hawg now stands in its place. At the start of the novel, sisters Kelly and Sheri are bringing up Kelly’s two young children, Ricky and Cindy Rae, with help from Kelly’s live-in boyfriend, Walter. A violent assault throws the family into a tailspin, and the repercussions of that night are felt for years to come. The assault, however, is just the latest in their family’s troubles. The effects of poverty and prejudice are omnipresent in their lives. They subsist on meager paychecks, fast food, and cheap booze, in constant cycles of action and reaction, trauma and repression. Shaffer gives names and faces to a group of Americans that are too often misrepresented in mainstream culture. Through Shaffer’s lens these rednecks, or white trash, are in fact complicated and multifaceted people, with deep internal conflicts and universal human desires. The shifting perspective reveals interior thoughts and motivations from various characters as the story unfolds. There is little time reserved for reflection or contemplation in their tumultuous lives. But as the novel progresses, and Ricky and Cindy Rae become teenagers, the siblings begin to question their family and to look for a way out. Cindy Rae searches for answers in their family’s history, deep in the Ozark forests. Ricky looks to the region’s lucrative and fast-growing drug trade. When his involvement with a local crime ring turns sour, they face a reckoning unlike any their family has yet experienced. There are few precedents of sympathetic storytelling for this particular class of American. Shaffer’s protagonists could easily be the villains of another story, like Harper Lee’s malicious and racist Ewell family. Quietly feared and publicly scorned, at best, they are the brunt of our jokes. At worst, they are the scapegoats of a society unwilling to admit its deep and pervasive flaws. They are ignorant, volatile, and unreasonable. These are the deplorables, so desperate for retribution, the only course of action they can see is to light their world on fire. Shaffer finds sympathy for them. With an unfaltering gaze, she explores their innermost motivations and fears. She pushes to understand these children, and all the forces that shape them. Shaffer has composed a new mythology, modern folklore for the new South. Her children of the country are tragic heroes, undone by their own poor judgment, yes, but also by the will of forces above and beyond their control. Shaffer cannot save these children, but she honors them with her lyrical prose, catching flashes of brilliance in their roughened edges. Maybe this isn’t a pretty story, but it is an undeniably valuable one. This entry was posted on December 5, 2016, 11:30 am and is filed under Guest Bloggers, Reviews. You can follow any responses to this entry through RSS 2.0. You can leave a response, or trackback from your own site.